Budwig Rubber Feet & Bumpers Provide the best traction for High-Volume air movers and dries flooring efficiently. The RIDGID AM2560 Air Mover is designed for pro’s and DIYers who want high volume air movement. The 3-speed heavy duty induction motor provides 1625 CFM with less vibration and noise. The collapsible handle, ball-bearing wheels and large handle maximizes mobility, and the extra long 30 ft. power cord increases your reach. 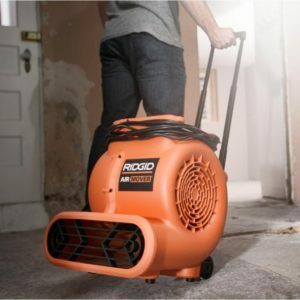 When you need a blower to dry large areas of carpets, floors, etc., this unit provides the powerful performance and rugged durability you have come to expect from RIDGID. This model uses Budwig Part # SF10T-PTR64-B. Custom Durometers provide the best results and have non-marker qualities like all Budwig Products. Call our sales team to see what rubber feet will work best for your application. We have over 50 sizes in stock and ready to ship today.